If ever there was a time when I was tempted to walk away from Brexit, that is now. There is no sense, rhyme or reason in the behaviour of parliament, which has passed Yvette Cooper's Bill through its third reading, by 313 votes to 312. This is the European Union (Withdrawal) (No. 5) Bill and, with a margin of one vote, that rather puts into perspective the claims that the leavers in the 2016 referendum only won by a margin of 52-48 percent, and thus the result lacks legitimacy. You don't get a narrower margin than one, which hardly confers on this result any great authority. Now, this fatuous Bill will go to the Lords, then having to come back to the Commons before Royal Assent. If it survives the parliamentary processes, it is at this point that Mrs May faces a direct challenge to the authority not just of her government but to the authority of this and successive executives, further weakening the power of Crown prerogative. Apart from its challenge to government, this is a Bill which should never have seen the light of day, seeking as it does to instruct the government to seek an extension to the Article 50 period, allowing parliament to decide on the length of the delay in our leaving the EU. Thus, the Bill makes no provision – and neither can it – for the fact that only the EU-27 can assent to an extension to the Article 50 period, and then by unanimity. Further, as the situation currently stands, there will only be one opportunity for the prime minister to seek an extension, which will be by close of business on 8 April, and then against conditions specified by the European Council. If the conditions are not met, then the European Council could simply refuse to extend the period, ignoring completely any request by the prime minister. But then the Cooper Bill triggers the ultimate in stupidity, requiring the prime minister to table a fresh motion specifying another amendable period and then go back to the European Council with it. At this point, assuming we haven't already dropped out of the EU without a deal, there is no requirement for the European Council even to listen to Mrs May again. Once it has made a decision, it need not re-visit it, no matter what might be in Cooper's production, in the event that it becomes law. But, if the MP collective was complicit in pursuing this irrational behaviour, albeit by the narrowest of margins, it was not the only time yesterday that we saw madness descend. I've stood in Central Lobby in the Commons after every Brexit vote in the past three weeks. What was stark this eve, was just how tired everyone looked. One MP said to me he was "mentally and physically exhausted", and he looked it. Nick Boles is not the only one who's had enough. It is fair to say, though, that Twitter comment from outside the bubble lacked a certain empathy. The disparity rather suggests a certain bond between the hacks and the politicians, one that had the Today programme's Nick Robinson complain, only half in jest, that withholding the mobile phones of cabinet ministers was denying them, "the basic human right of texting their mates in the media". This has always been a weakness of the system, especially with lobby journalists who become so close to the politicians on whom they report that a degree of dependency develops and any sense of objectivity disappears. The media simply becomes a megaphone for the political classes. And megaphone it has become, recording the voting of the paving Bill, to allow Cooper's Bill to proceed, which the House approved by 312 votes to 311, the first slender majority of the day. When it reached the second reading, the hacks duly recorded the passage by five votes, and so it went on. No word could be seen of direct criticism, with the Mail telling us blandly that MPs had "blocked Britain's path to No Deal Brexit and forced the Prime Minister to ask the EU for an extension". Of course, they have done no such thing, but then newspapers are simply vehicles to attract readers to paying adverts, so they need not be too pedantic about things like accuracy. As long as the clicks to the website keep coming, they have a business. The moronic end of the spectrum, though, is better served by HuffPost, which runs the headline, "MPs force Theresa May to delay Brexit and block no deal - but only by one vote". This brings media illiteracy to new heights, out-competing even the Mail. Even then, it can't compete with the fatuity of CNN which writes: "No-deal Brexit outlawed". If you want it really wrong, you can always trust the Septics. This makes something of a contrast with the supposed upper-end of the UK media, as The Times did not seem to have reported the Cooper votes at all, even into the small hours of this morning. That leaves the "quality" press represented by the Telegraph. It has its own brand of misleading headline, declaring: "Bill to prevent No-deal passes by one vote after May holds talks with Labour leader". As to the talks between Mrs May and Jeremy Corbyn, these have been "constructive", just in case anyone is interested, but this is small beer compared with the torrent of news on the Tory party "civil war", which is keeping the media entertained. I suppose there is a more tedious subject in the world, but the media works on the basis that what it finds interesting necessarily interests us all, so we are treated to a wall-to-wall soap opera which covers every twist and turn. 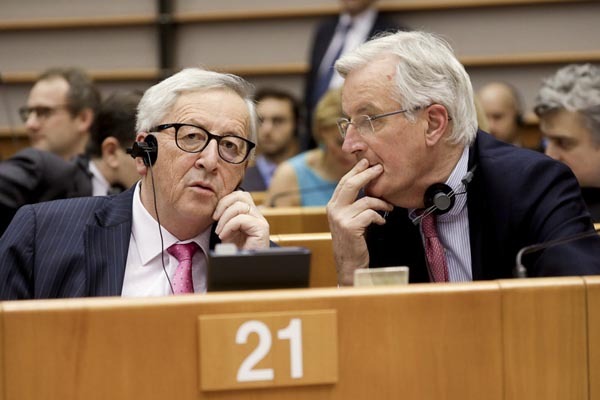 Meanwhile, Jean-Claude Juncker has been addressing the European Parliament, specifically on the subject of Brexit, telling MEPs that 12 April is the ultimate deadline for the approval of the Withdrawal Agreement by the House of Commons. If it has not done so by then, Juncker says, no further short extension will be possible. After 12 April, we risk jeopardising the European Parliament elections, and so threaten the functioning of the European Union. In his view, the European Council had given the UK the "time and the space" to decide where it wanted to go yet, he believed, "a 'no deal' at midnight on the 12 April is now a very likely scenario". It was not the outcome he wanted but, he said ominously, "it is an outcome for which I have made sure the European Union is ready". He reminded MEPs that the EU had taken measures which would mitigate the worst impact of a "no-deal" scenario, but they would be "time-limited and unilateral", providing a cushion for key EU interests. For the UK, there was no such thing as a "managed or negotiated no-deal" and no such thing as a "no-deal transition". And if the UK wanted to talk after a no-deal Brexit, EU citizens' rights would still need to be upheld and protected, the UK would have to "honour its financial commitments" and a solution would still need to be found to the Irish problem. This provides the ultimate contrast. We have the babies in Westminster living in their fantasy world, pretending to legislate a no-deal out of existence, rather than face the reality of ratifying the Withdrawal Agreement, while the president of the European Commission was in Brussels, telling the other parliament that we were facing a no-deal exit on 12 April. Both can't be right, yet you would get no clue of the discrepancies from the media. MPs have banned a no-deal, and the poor dears are "mentally and physically exhausted" – to say nothing of being brain dead.